Environmental enforcement? Yes, there’s an app for that too. As California’s permanent budget crisis results in continuing cutbacks to environmental agencies, IBM has rolled out Creek Watch, an iPhone app that lets the State Water Resources Control Board crowdsource the condition of the Golden State’s waterways. Here’s how it works: You’re out for a jog, or a hike, or just walking the dog. When you cross a creek, stream, or other body of water, you pull out your iPhone and fire up the Creek Watch app. 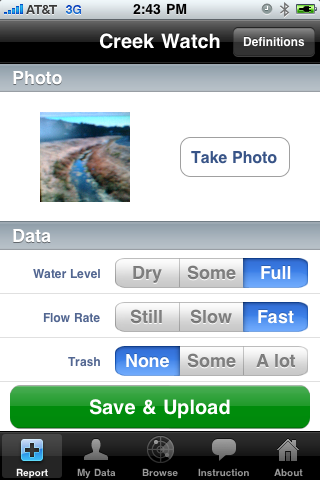 The app asks you to take a picture of the creek and then click on tabs that note the water level (dry, some, full), flow rate (still, slow, fast), and the amount of trash (none, some, a lot). Other screens define those terms and show photos as examples. For instance, “a lot” of trash is 10 or more pieces of debris. There’s also a place for citizen scientists to jot down additional observations. The app uses the iPhone’s GPS chip to pinpoint the creek’s location, and the photos and information are uploaded to the Creek Watch database, which can be tapped by state water officials. “Creek Watch lets the average citizen contribute to the health of their water supply — without PhDs, chemistry kits, and a lot of time,” Christine Robson of IBM’s Almaden Research Center in San Jose said in a statement. “With more than 700 miles of creeks in Santa Clara County alone, we need innovative technologies like this one to empower the community to help us continuously improve our water quality and the ecosystem,” noted Carol Boland, a watershed biologist for the city of San Jose. So far, the reviews of the app by citizen water monitors have been positive. If you want a birds-eye view of the future of power, scramble up to the roof of a 562,089-square-foot warehouse in Ontario, a city that sits in the smoggy heart of Southern California’s Inland Empire east of Los Angeles. On a roof the size of several football fields, workers are busy installing 11,591 solar panels that will generate 2.55 megawatts of electricity. Across the street is another massive warehouse blanketed in photovoltaic panels. Beyond that lie two more warehouses with solar arrays under construction. 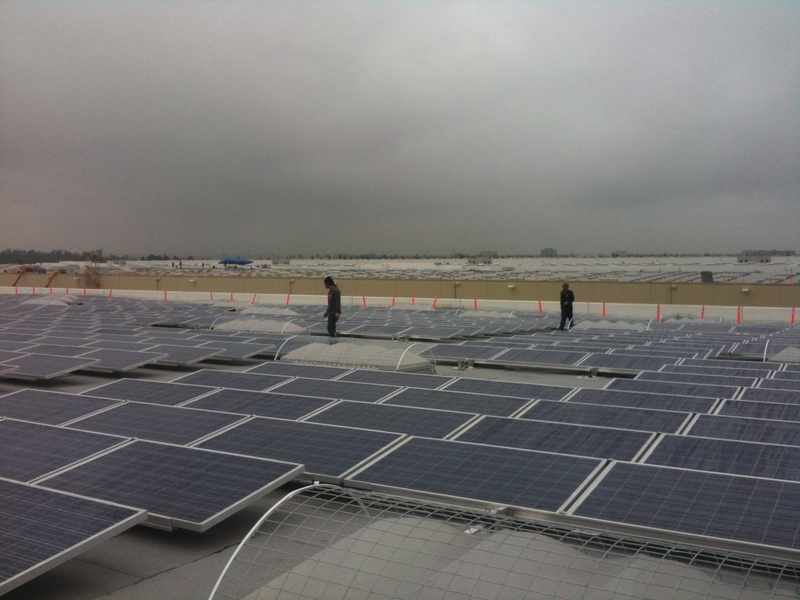 Warehouses themselves use relatively little electricity, so owners lease their roofs to utility Southern California Edison, which own the solar arrays and feeds the power they produce into the grid. Over the next five years, the utility will install 250 megawatts worth of photovoltaic panels on big commercial rooftops and buy an additional 250 megawatts from solar developers that will build and operate warehouse arrays. At peak output, those solar arrays will generate as much electricity as a mid-sized fossil-fuel power plant. “In the Inland Empire you’ve got big buildings and good sun,” Rudy Perez, manager of the utility’s solar rooftop program, said as we stood on the top of the warehouse where solar panels covered the roof as far as the eye could see. He noted that the number of applications from solar developers to connect rooftop photovoltaic projects to the grid has tripled in the past six months alone. That’s because the rise of renewable energy and electric cars will vastly complicate how the power grid operates. “We could literally have more change in the system in the next 10 years than we’ve had in the last 100 years,” Theodore F. Craver, Jr., chief executive of the utility’s parent company, Edison International, said in an interview after meeting with executives from French utility giant EDF. The French had come to Los Angeles to learn about Southern California Edison’s smart grid efforts. In the current, mostly analog grid, the distribution of electricity is fairly straightforward. A utility or another company builds a fossil-fuel-powered plant and flips the switch. For the next 30 years or more, electricity flows into high-voltage transmission lines hour after hour, day after day. The transmission lines carry the electricity to a distribution system where transformers “step down” the power to a lower voltage and then send it to homes and businesses. And though technological improvements have been made over the decades to the grid, it remains essentially a one-way system. And while storms and accidents can bring down power lines and blackouts can occur when demand soars on a hot day and electricity generation can’t keep up, power flows 24/7 from a natural gas or coal-fired plant. Now consider the challenges posed by intermittent sources of electricity like solar and wind, not to mention the prospect of thousands of cars plugging into the grid at once to recharge their batteries. And why it’s necessary to build a digitalized grid that deploys software, sensors, and other hardware to monitor and manage electricity distribution and troubleshoot problems. Instead of relying on dozens of big power plants, the smart grid of the future will increasingly tap thousands or millions of individual rooftop power plants and wind turbines. It will need to collect information about their electricity output and balance the flow of electricity throughout the grid — to ensure that a neighborhood doesn’t go dark because a large cloud is hovering over the solar array atop the local Costco. “As we start to replace more of the generation with different technologies, we are altering the physics of the system,” said Pedro Pizarro, Southern California Edison’s executive vice president of power operations. This drizzly October morning is a case in point. A ceiling of gray clouds hangs over the four Ontario warehouses that altogether would be generating some 7.59 megawatts if the sun were shining at peak intensity. So the smart grid also needs to be able to forecast the weather and know, say, that for the next few days electricity production is going to fall in one area while it might rise another, sun-splashed one. Down the coast at the University of California, San Diego (UCSD), researchers have built what looks like a mirrored hemispherical bowl that scans the skies and snaps two photos a minute to predict when clouds will form over the campus’ one-megawatt worth of solar panels that are installed at seven locations. He said the scientists’ goal is to be able to use the machines, which cost $12,000 apiece and have a range of one kilometer (0.62 miles), to do hourly forecasts with 90 percent accuracy. “So a capital investment of less than $1 million could bring this to the Southern California rooftop market if we crack the science,” said Washom, referring to the concentration of warehouses in places such as Ontario. Another smart grid strategy is to store energy generated by solar arrays in batteries and feed power to the grid when renewable energy production falls or demand spikes. Washom showed a picture of a device that looks like the back end of a DVD player. The Sanyo lithium ion battery can store 1.5-kilowatt hours of electricity. UCSD plans to stack them like servers in a data center so it can store 1.5 megawatts of electricity produced by campus solar arrays. In the San Francisco Bay Area, SolarCity, a solar panel installer, and electric carmaker Tesla Motors have received a $1.8 million state grant for a pilot project that will put lithium ion car batteries in half a dozen homes with rooftop solar arrays. The Sacramento Municipal Utility District (SMUD), meanwhile, plans to install lithium ion batteries in 15 residences as part of its smart solar homes program. The utility will also put two 500-kilowatt batteries near substations to test energy storage on a larger scale. So will the smart grid and increasing production of rooftop solar and other renewable energy spell the end of big centralized power stations and the multibillion-dollar transmission infrastructure? Will the future bring some sort of Ecotopian nirvana where power is put in the hands of the people (or at least on their rooftops)? Not anytime soon, according to Pizarro of Southern California Edison, barring technological breakthroughs that dramatically reduce the cost of photovoltaic power. “Right now solar is increasing but it’s not overwhelming the system,” says Pizarro, noting that rooftop photovoltaics remain a tiny percentage of the overall power supply even in places like California, where utilities must obtain a third of their electricity from renewable sources by 2020. The other wild card is the price of oil and natural gas, notes Craver, Edison’s chief executive. When the cost of natural gas — the dominant energy source in California — rises, renewable energy becomes more attractive. When natural gas prices plunge, as they have over the past couple of years, installing solar becomes far more expensive in relative terms. At last month’s solar conference, SMUD’s Rawson said his utility currently relies on photovoltaics, or PV, for less than one percent of its electricity generation. But that will likely change dramatically in the years ahead, he says, as the smart grid evolves to handle the widespread distribution of solar power. “We’re trying to change PV from something that is tolerated by the utility to something that is controlled by the utility,” he said. SAN FRANCISCO — Solyndra, a Silicon Valley solar-panel maker that won half a billion dollars in federal aid to build a state-of-the-art robotic factory, plans to announce on Wednesday that it will shut down an older plant and lay off workers. The cost-cutting move, which will reduce the company’s previously announced production capacity, is a sign of the notable shift in the prospects for cutting-edge American solar companies, which now face intense price competition from Chinese manufacturers that use more established photovoltaic technologies. Just seven weeks ago, Solyndra opened Fab 2, a $733 million factory in Fremont, Calif., to make its high-tech solar panels. The new plant was supposed to be the first phase of a rapid expansion of the company. Instead, Solyndra has decided to shutter the old plant and postpone plans to expand Fab 2, which was built with a $535 million federal loan guarantee. When Solyndra filed for an initial public stock offering in December, it estimated it would have a total production capacity of 610 megawatts by 2013 if its two plants were fully built out. The company now expects it have capacity of 285 to 300 megawatts by 2013. Solyndra abandoned plans for the stock offering in June, citing market conditions. The company is the most prominent of a wave of Silicon Valley solar start-ups that hoped to transform the economics of the industry. Gov. 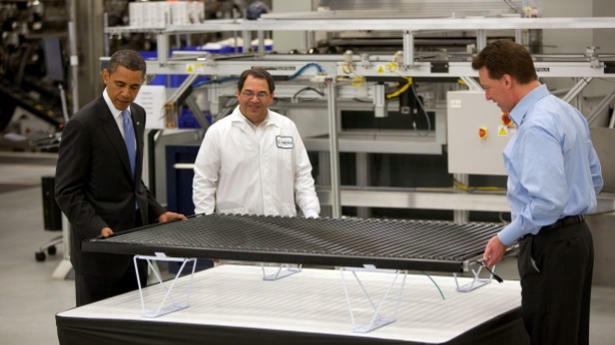 Arnold Schwarzenegger of California and Energy Secretary Steven Chu helped break ground on Fab 2 last year, and President Obama made an appearance at the unfinished factory in May to extol Solyndra’s innovative technology. Mr. Harrison noted that the market had undergone a significant shift since Solyndra filed for the stock offering, with solar module prices plummeting as low-cost Chinese manufacturers like Suntech and Yingli ramped up production. In an article in Friday’s paper, I write about the solar thermal power plant building boom now under way in California’s Mojave Desert. The looming expiration of crucial federal financial support for the multibillion-dollar projects, though, could turn the boom to bust. But that hasn’t deterred California regulators, who on Thursday approved the seventh large-scale solar thermal farm since late August. After years of painstaking environmental review, the California Energy Commission has been green-lighting the massive solar power plants at warp speed so developers can break ground before year’s end and qualify for a government cash grant that covers 30 percent of the cost of construction. The latest approval goes to Tessera Solar’s Calico project, to be built in the San Bernardino County desert in Southern California. Originally proposed to generate 850 megawatts -– at peak output, that’s close to the production of a nuclear power plant -– the project was whittled down to 663.5 megawatts to lessen the impact on wildlife like the desert tortoise and the bighorn sheep. It’s difficult to appreciate the sheer scale of even the smaller version of the Calico project until you’ve seen Tessera’s Suncatcher solar dishes on the ground. A few years ago I had the opportunity to visit a prototype six-dish Suncatcher solar farm at the Sandia National Laboratories in New Mexico. Resembling a giant mirrored satellite receiver, each Suncatcher stands 40 feet tall and 38 feet wide with a Stirling engine suspended on an arm over the center of the dish. As the dish tracks the sun, its mirrors concentrate sunlight on the hydrogen gas-filled heat engine. As the superheated gas expands, it drives pistons, which generates 25 kilowatts of electricity. Now imagine planting 26,540 Suncatchers on 4,613 acres of federal land for the Calico project. Tessera, based in Houston, has also received approval for a 709-megawatt solar power plant to be built in California near the Mexico border. That will require the installation of 28,360 Suncatchers. “These desert solar projects will provide clean power for our schools, homes, and businesses while reducing fossil fuel consumption, creating local jobs, and reducing the greenhouse gas emissions that threaten California’s economy and environment,” Anthony Eggert, a member of the California Energy Commission, said in a statement on Thursday. The cost to build the two projects will exceed $4.6 billion, according to Tessera, and it’s highly unlikely that they’ll go online unless the company receives federal loan guarantees that allow developers to borrow up to 80 percent of construction costs on favorable terms. That program expires next September, and Tessera needs to start putting steel into the ground by the end of the year to qualify for the cash grant program. NIPTON, Calif. — The long-promised solar building boom in the desert Southwest is finally under way. Here in the Mojave Desert, a dice throw away from the Nevada border, giant road graders and a small army of laborers began turning the dirt for BrightSource Energy’s $2 billion Ivanpah project, the first large-scale solar thermal power plant to be built in the United States in two decades. The Ivanpah plant is the first of nine multibillion-dollar solar farms in California and Arizona that are expected to begin construction before the end of the year as developers race to qualify for tens of billions of dollars in federal grants and loan guarantees that are about to expire. The new plants will generate nearly 4,000 megawatts of electricity if built — enough to power three million homes. But this first wave may very well be the last for a long time, according to industry executives. Without continued government incentives that vastly reduce the risks to investors, solar companies planning another dozen or so plants say they may not be able to raise enough capital to proceed. “I think we’re going to see a burst of projects over the next two months and then you’re going to hear the sounds of silence for quite a while,” said David Crane, chief executive of NRG Energy, on Wednesday after he announced that his company would invest $300 million in the Ivanpah plant. Solar developers depend on two federal programs to make their projects financially viable. The most crucial is a loan guarantee program, expiring next September, that allows them to borrow money on favorable terms to finance up to 80 percent of construction costs. The other is the option to take a 30 percent tax credit in the form of a cash payment once a project is built. Although the tax credit does not expire until the end of 2016, the option to take it as a cash payment disappears this year, making it far less valuable to a start-up company that is just beginning to generate revenue. With both Democrats and Republicans promising to rein in the federal budget, it is unclear whether lawmakers will extend the programs in any form. “That could stall a number of projects and even lead to the failure of some,” said Ted Sullivan, an analyst with Lux Research, a consulting firm in New York. Yet no one in the desert here wants to think too much about those looming clouds. The eight California projects that are expected to break ground this year will turn 46 square miles of the desert into a futuristic landscape of mirrors, towers and solar dishes. State officials estimate the plants will create 8,000 jobs in a state with a 12.4 percent unemployment rate. During its three years of construction, Ivanpah will employ as many as 1,000 laborers in a recession-scarred region. The state is supporting the industry in part by mandating that California utilities get a third of their electricity from renewable sources by 2020. “When you look at the raw number of kilowatt-hours we need, I don’t see how you get there without large central station solar projects,” said Pedro Pizarro, a top executive with Southern California Edison, one of the state’s largest utilities. Unlike the photovoltaic panel systems found on rooftops, most of the new solar plants will use thousands of large mirrors to heat liquids to generate steam that drives conventional electricity-generating turbines. “Without the Department of Energy coming in to assume a lot of the risk, you might not find lenders willing to lend, particularly if you’re a start-up with untried technology,” said Nathaniel Bullard, a solar analyst at Bloomberg New Energy Finance. Other hurdles also stand in the way of the solar expansion. For some plants, multibillion-dollar transmission lines must be built to carry electricity from the desert to cities. 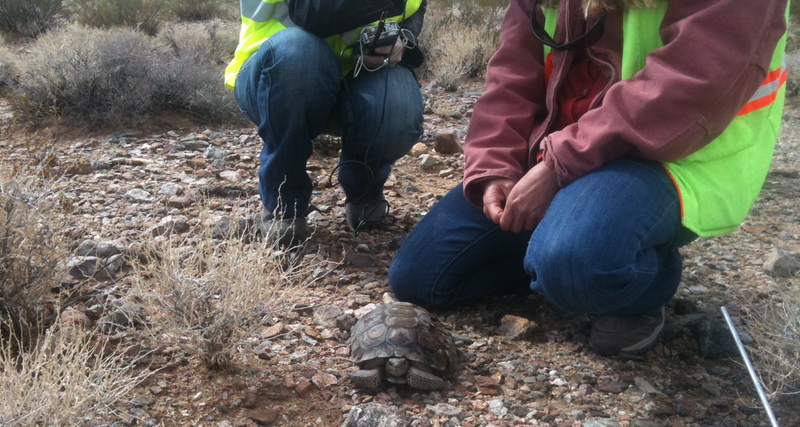 Some environmentalists continue to oppose the projects’ impact on imperiled wildlife, such as the desert tortoise, and may sue to stop construction. 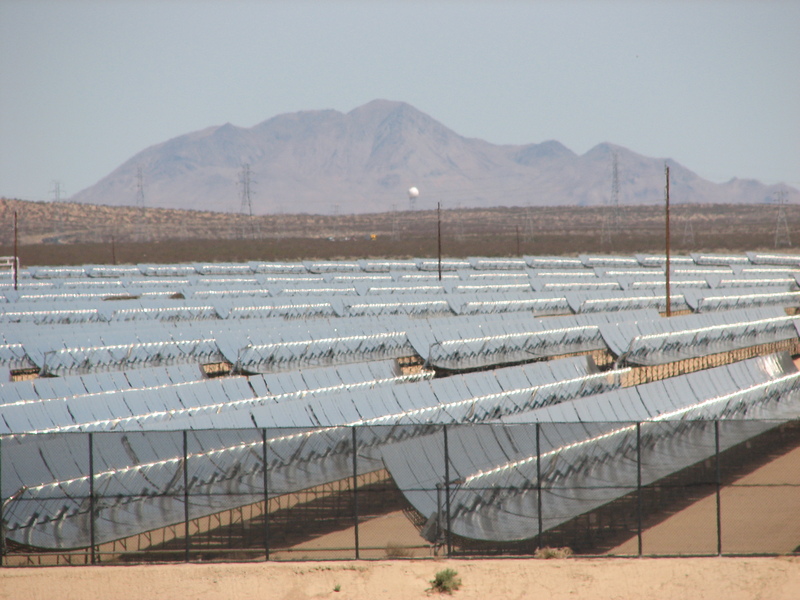 The competitiveness of large-scale solar thermal plants in California also depends on the cost of natural gas, the state’s dominant source of electricity. According to Mr. Bullard, gas-fueled plants can produce electricity for about 10 cents a kilowatt-hour. After including the government subsidies, solar thermal plants are expected to generate power at 13 to 17 cents a kilowatt-hour, which the industry says is close enough in price to be competitive. So far, Ivanpah is the only California solar thermal project to win a government loan guarantee, although other projects have applied and are awaiting decisions from the Energy Department. The uncertainty has left even some of the licensed solar projects in limbo. Today, California Gov. Arnold Schwarzenegger, Interior Secretary Ken Salazar, and other dignitaries gathered in the Mojave Desert to officially break ground on BrightSource Energy’s Ivanpah Solar Electric Generating System, the first large-scale solar thermal power plant to be built in the United States in nearly two decades. BrightSource is one of a half-dozen big solar farms, with a combined electricity-generating capacity of 2,829 megawatts, licensed by the California Energy Commission over the past two months. By year’s end, California and federal regulators expect to approve additional projects that will produce a total of 4,143 megawatts. At peak output, that’s the equivalent of several nuclear power plants and more than seven times the solar capacity installed in the United States last year. 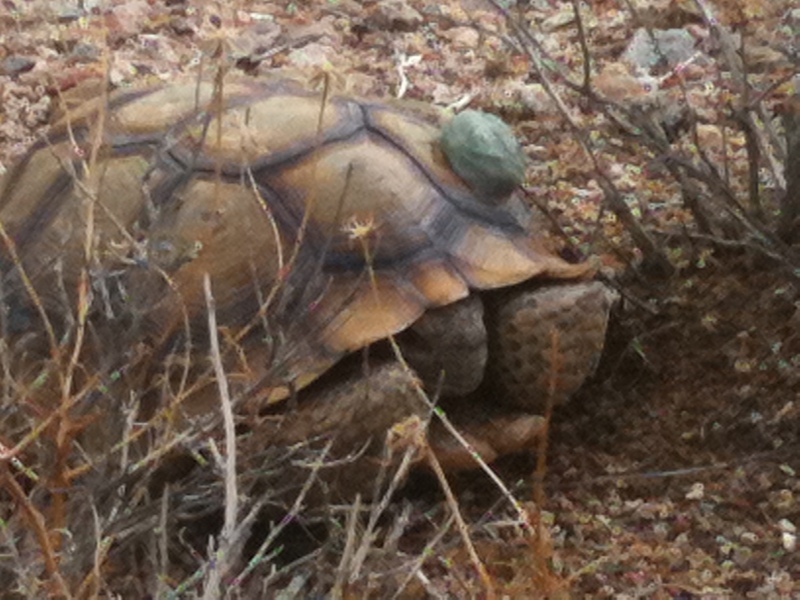 The approval of the projects comes after years of environmental review and controversies over the installations’ impact on water, wildlife, and fragile desert landscapes. The power plants licensed so far will cover some 39 square miles of desert land with a variety of new and old solar thermal technologies. Unlike rooftop photovoltaic panels that directly convert sunlight into electricity, solar thermal uses the sun to heat liquids to create steam that drives electricity-generating industrial turbines. BrightSource’s 370-megawatt Ivanpah project, located just over the California border, 40 miles southwest of Las Vegas, is the world’s largest solar-thermal power plant project currently under construction. The company, led by CEO John Woolard, received a $1.37 billion loan guarantee from the United States Department of Energy to build the project, which will deploy 347,000 large mirrors that will surround three towers on 3,500 acres of federal land. The mirrors will focus the sun on a water-filled boiler that sits atop the tower to create high-temperature, high-pressure steam. Woolard, 45, came to BrightSource as chief executive in 2004 after co-founding Silicon Energy, an energy efficiency software company, and stints at California utility PG&E, the Lawrence Berkeley National Laboratory, and VantagePoint Venture Partners, a leading Silicon Valley green tech venture capital firm. He sat down with Yale Environment 360 contributor Todd Woody at BrightSource’s Oakland, Calif., headquarters to talk about the future of Big Solar and the challenges the industry faces — from a woefully inadequate electricity grid to the imperative of minimizing water use — as multibillion-dollar projects finally begin to become a reality. Yale Environment 360: Are we witnessing the birth of a major new solar industry in the United States? John Woolard: I hope. The number I always go back to is that we have done 74,000 permits for oil and gas in the last 20 years and we finally have five or six for solar. That’s a good step forward. The agencies are learning how to permit, they’re learning how to move forward. It’s great for the industry and we can finally get some size and consequence. e360: As the photovoltaic industry increasingly becomes dominated by overseas companies in China and elsewhere, does the sheer scale of these solar thermal projects in the U.S. give the country the opportunity to become the technological and market leader? Woolard: Oh, yeah. 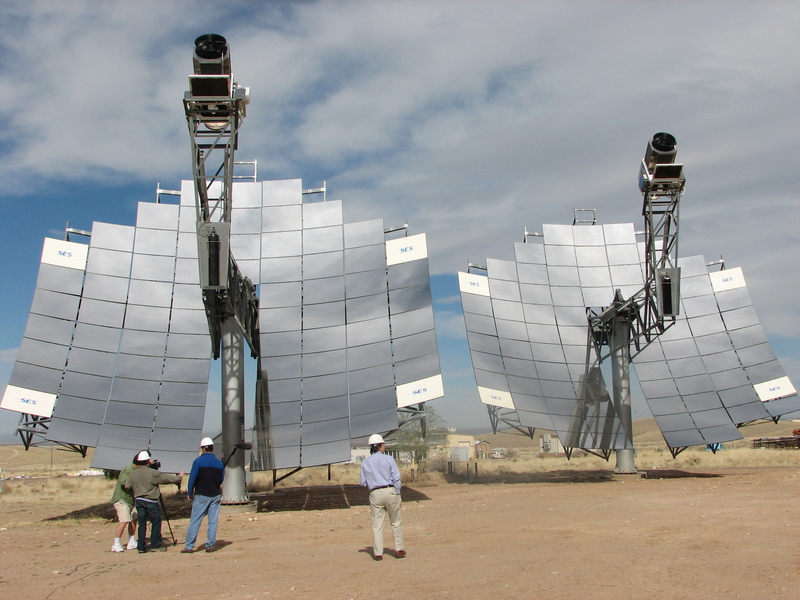 Solar thermal is very different from [photovoltaic technology]. The power has different characteristics and is more reliable. They’re almost apples and oranges. Solar thermal has got very interesting We don’t have a quantity and energy problem; It’s a collection and distribution problem.” attributes and characteristics that make it unique. In the U.S. we’re lucky. The southwestern U.S. has high desert, which means it’s closer to the sun, less atmosphere to go through. It’s the best solar resource anywhere, outside the Anaconda Desert in Chile or a few places. Harnessing that resource effectively is the most important thing. So we don’t have a quantity and energy problem; it’s a collection and distribution problem. e360: BrightSource’s Ivanpah project is not only the first large-scale solar thermal project to break ground, it is the first to deploy a new power tower technology. Why is that significant? Woolard: Our team was part of building older trough plants and you learn a lot. If you take a power tower, you get higher temperatures and pressures. That gives you higher thermo-to-electrical conversion efficiency. Think of that as more efficiency, less waste, lower cost. Because of that, you need fewer mirrors, less solar field, and you have a more efficient design. The other gets down to how you actually build on the land. If you take the older trough designs or anything with a lot of mirrors, [it] would degrade the land. It’s more damaging from a soil and runoff perspective. The big [problem] is water. What is the world going to look like over the next 20, 30, 40 years? Water in the desert is going to become a much more challenging proposition. So we’ve gotten water usage down to a minimum — the lowest of anybody in the world, basically. The United States is on the verge of a solar boom that could provide 4.3 percent of the nation’s electricity by 2020, according to a new report from Bloomberg New Energy Finance. There’s just a 12-figure catch: Investors need to put $100 billion into the solar industry to keep the generation of solar electricity growing by 42 percent a year for the next decade to expand capacity from the current 1.4 gigawatts to 44 gigawatts. Over the past two years, solar module prices have plunged by 50 percent as low-cost Chinese manufacturers expanded production and entered the U.S. market. Exhibit A for such a phenomenon is Germany. With about as much sunshine as Maine, the European nation became the world’s solar stronghold through policies that rewarded homeowners, businesses, and farmers for generating their own electricity. Such policies are needed in the U.S., according to the report, given that solar electricity remains four times as expensive to generate than coal-fired power. Of course, the failure of Congress to pass national climate change legislation and the current attempt to kill California’s global warming law shows that progress on green energy issues is not guaranteed in the U.S. And Congress’ habit of offering short-lived tax incentives for renewable energy and then dithering about extending them when they expire has played havoc with the industry and investors. Bloomberg New Energy Finance predicts photovoltaic panels will account for 30 gigawatts of the 44 gigawatts of solar electricity generation by 2020, with 14 gigawatts coming from solar thermal power plants. Solar thermal farms deploy huge arrays of mirrors to heat liquids to create steam that drives electricity-generating turbines. That might be a conservative estimate, if the California and federal officials’ rush to green light big solar projects in recent weeks is any indication. On Monday, for instance, Interior Secretary Ken Salazar approved a 1,000-megawatt solar thermal power plant to be built in the Southern California desert. By year’s end, nearly four gigawatts of solar thermal projects are expected to be licensed. Just 10 gigawatts to go until 2020.